When she’s not working with big names like Mandy Moore, celebrity makeup artist Jenn Streicher is part of the Laura Mercier Makeup Artist Collective, and she’s agreed to share her expertise with us via our new Ask an Artist series. Need help selecting the best foundation for your skin type? Want to master a three-minute eye makeup look? Come back every month for a unique beauty lesson from a pro. A hooded eye: That sounds a little dark and mysterious, but it’s not. It’s simply an eye shape. Some people have brown eyes; some blue. Some people have almond-shaped eyes, and others have hooded eyes. Just as you change the shadow shades you’re working with based on your eye color, the way you apply your eye makeup depends on eye shape. Since there isn’t a defined crease, hooded eye shapes pose the unique challenge of how and where to add that definition. Enter: Jenn Streicher (who you may recognize as one third of the beauty power trio known as the Streicher sisters). She gave us the basics and taught us a pretty dreamy look for hooded eye shapes. Of course, it’s one that not-so-hooded eyes can do too. See for yourself. Always start with a primer. Streicher says this is particularly important for hooded eyes because the skin on the lids touches. Then you can apply a base shade all over the lid. Streicher’s favorite base? Laura Mercier’s Caviar Stick Eye Colour ($29). “It makes anything that you put over it better; it makes that shadow last better,” she says. And of course, as any pro will tell you, blend, blend, blend before moving on to your next shade. For this base color, we used one of the new matte (yes, matte—we’re just as excited, don’t worry) Caviar Stick Eye Colours, Blossom. Next comes the obvious yet tricky part: creating the illusion of crease. This is where Streicher says a lot of women go wrong. “Most people, when they put eye makeup on, kind of lift their chin into the mirror, but you don’t want to do that if you have hooded eyes.” (The moment she said that, everyone in the room nodded in agreement.) Instead, look straight ahead. You’re trying to create something that’s not there, so you need to look directly in the mirror in order to place the color exactly where you want it—where you would see a crease. So for hooded eyes, this is slightly higher than you might see with other eye shapes—just above that fold where the lids meet. Jenn’s other key tip is to start light: “Almost trace it,” she tells us. (You can even start with a light shade.) That way you can see you’ve got the placement right; then deepen the pigment and blend it out (with a back and forth motion). Keep most of the color near the outer eye, “like bringing the color out from the middle if you’re looking from the middle of your eye,” says Streicher. As you blend, you’ll naturally sweep a little bit of color toward the inner corner. 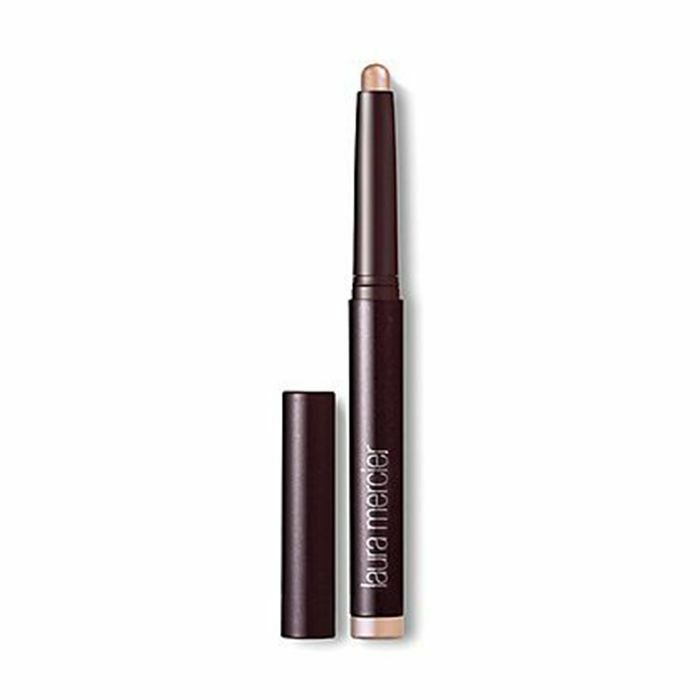 We used Laura Mercier’s Caviar Stick Eye Colour in Burnished Bronze ($29) for this step. And now a familiar step: Add a light-colored shimmery shade to brow bone. Choose something subtle like the Rosegold Caviar Stick Eye Colour ($29) we used here. “You don’t want to bring it down too far because you’re trying to create that crease, and you want it to be super subtle,” Streicher notes. And, of course, not to sound like a broken record, but make sure to blend. “You don’t want to see where a color ends and another begins; it should all be a lot of blending,” the makeup artist advises. Crease color was focused on the outer corner. Now it’s time to brighten up the inner corner with a light shade. Take that same light-colored shimmer (for us, that’s Rosegold), and apply it to the inner corners. This not only opens up the eyes but also helps elongate their shape. This is the step that Streicher says is mandatory, and it’s probably one you’re skipping: Add color to the lower lid. “The bottom lid is an especially great tool because it creates contour,” Streicher says. Just like with the crease color, let the lower lid color taper off as you near the inner corner. We used the Copper Caviar Stick Eye Colour ($29) for this step and smudged a bit of Burnished Bronze (the crease color) directly into the lash line for a little added definition. Finally, add mascara. We like Laura Mercier's Extra Lash Sculpting Mascara ($26). And don’t be afraid to add mascara to the lower lashes too. Or for special occasions, Streicher recommends adding a few individual false eyelashes to the outer corners to up the eyes even more and add an extra oomph. Final thoughts for hooded eyes and all eye shapes: Layer your shadows, and blend, blend, blend. Any other questions to ask our makeup artist? Tell us anywhere—Facebook, Instagram, Twitter—and our resident pro Jenn Streicher could answer your question in our next installment of Ask an Artist. Keep checking back for more!